This weekend the ebook version of Pendulum of Justice, the first Hank Rangar Thriller, is on sale for $0.99. The sale starts Thursday, November 12 and lasts through Sunday, November 15, 2015, just in time for your Thanksgiving weekend reading. WOW! I feel like I just watched a movie in my head. 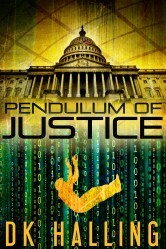 Click here to get your copy of Pendulum of Justice. Don’t miss Hank in Trails of Justice, the second Hank Rangar Thriller. A global conspiracy to eliminate the 2nd Amendment results in the deaths of 1000s and Hank Rangar knows too much. I enjoyed this book enough to read it straight through. Hank Rangar didn’t disappoint, maintaining his personal commitment to helping those in government that like to practice predation and abuses of individual rights and liberties of American citizens, to achieve their just rewards. If you believe in freedom of the individual and his rights and a limited role for those in positions of government power and enjoy complex characters in your stories, you’ll love this book and these authors. Teslas’s New Patent Policy: Long Live the Patent System!. Dagny Taggart – We the Living by Ayn Rand.